New Jersey Jack Pinball Machine coming soon ! SS Billiards has been serving the Twin Cities for over 46 years, providing a safe, friendly place for friends and families to relax and have fun. Whether you prefer playing at one of our five regulation sized pool tables, enjoying the large collection of pinball machines, usually around 20. And some video games. We are not a bar, and it shows in the atmosphere of SS Billiards - both in our well-maintained facilities and our friendly staff. We have been family owned and operated since we opened our doors in 1972, and thank you all for your support over the years. 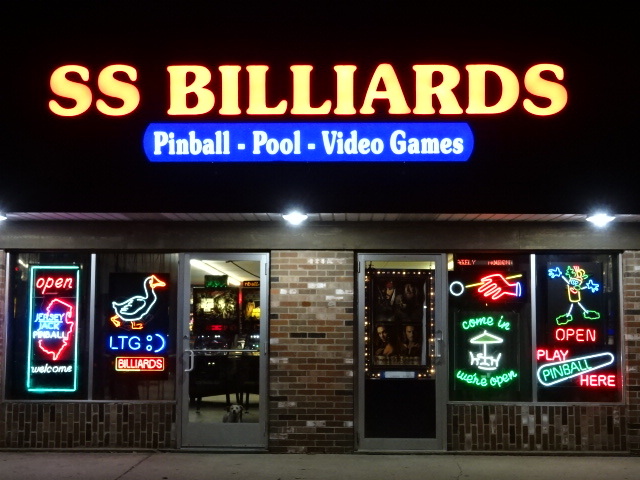 SS Billiards is located just south of downtown Hopkins Minnesota in the Westbrooke Square mall -- 732 11th Avenue South, Hopkins MN 55343. Our hours are noon to midnight Monday through Saturday and 2:00 pm to 10:00 pm on Sunday. We are open normal hours Memorial day and Labor day weekends, the day after Thanksgiving, and New Years day, and are closed on the 4th of July, Thanksgiving day, Christmas Eve day, Christmas day and News Years Eve day.